“I’m very honored and flattered. That’s kind of what you aspire – to develop a program and be recognized for your contributions,” Lorenz said. Distinguished professor is a high honor reserved for only the very best faculty at the U of Arkansas in recognition of sustained excellence in the performance of their duties. He especially likes the diversity he has in his job. “It’s constantly changing depending on what the situation is,” he said. However, his focus has always been to work on better solution for pest management for cotton, rice, soybeans and other row crops. Lorenz was raised on a farm and has always had an interest in agriculture. However, he didn't know he was going to be an entomologist. “Not a lot of kids want to be the ‘bug guy’,” he said. He thought he was going to be a veterinarian, but realized that wasn't his passion. He tried an entomology class and liked it, but not until he got to apply what he learned in the classroom to the field -- working a summer job as a cotton scout. In 1985, Lorenz started with the Extension Service as a Jefferson County agent. He then became the soybean verification coordinator, soybean and wheat verification coordinator, and cotton verification coordinator. He went back to school to get his PhD in entomology at the University of Arkansas and then returned as extension entomologist for the University of Arkansas System Division of Agriculture. He’s now in his 30th year at the Cooperative Extension Service. He lives in Greenbrier with Barbara, his wife of 37 years, and son Bradley, who just started a job as an accountant after graduating from the University of Arkansas. In his free time, he loves to duck and turkey hunt and read. 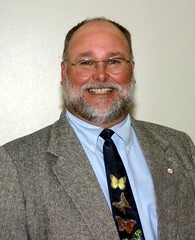 Besides the distinguished professor award, Lorenz has received an Award for Outstanding Specialist from the Arkansas Association of Extension Specialists, Recognition for Support of the Programs from the USDA-APHIS, Recognition for Stink Bug Educational Program from the Riceland Foods, John White Award for Distinguished Service to the U of A System Division of Agriculture, Southern Region IPM Team Award, Gamma Sigma Delta, Extension Award of Merit, Educational Materials Award (Agronomy Society of America), Unit Team Extension Excellence Award, Distinguished Achievement Award-Extension, Southeast Branch-Entomological Society of America, and IM Educator Award-SE Region IPM Center. To learn more about crop production, visit www.uaex.edu or contact your county extension office.